We made it through security and are waiting for our flight. Introducing you to AWE 2017 cohort (from the left) are Jessica, Ashley, Maddie, Megan, Nikki, David & Lenka. Rocky decided to join us for the duration of the course. today is the day! 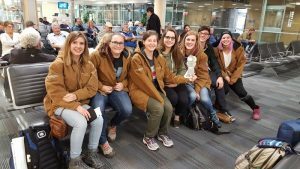 The day that I and six other DAL students begin our journey to South Africa with our instructors, Sarah and Janine. After a 4 hour drive from New Brunswick to the Halifax Airport, I hugged my family one last time and waited with Ashley for the rest of our crew. Once happily re-united, we proceeded our way through checkout for our 11:45pm flight. Where have we been, well from Halifax we landed in London Heathrow around 9:30am. Most students did well, others not so much but they will remain, nothing drastic just a little travel sickness. After the 5 hour flight we were all tired but still held it together. Surprisingly, it felt like we were still in Canada. 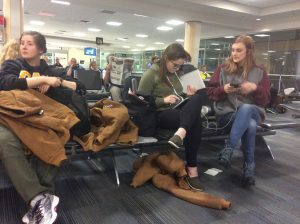 Other than the British accents, Harry Potter themed store and some other British stores we may as well have been at the Toronto Airport. After we had some lunch our group regained our high spirits. We explored a bit of the airport or took turns sleeping in the ‘comfortable’ chairs. Nine hours was a long layover, so we took the opportunity to rest, write in our field journals and get to know each other better. We were relieved when the time finally came to take our flight to Johannesburg. Once seated we either slept, binge watched movies or read. It was an uneventful flight with little turbulence and everyone felt tired but good after the 12 hours flight. I was sitting in the middle group of seats with Jessica, David and Ashley. The windows only showed the wings of the plane, so even when we were over Africa I couldn’t see anything. I literally had my first view of South Africa as we got off the plane and walked into the airport. “We’re…in AFRICA!! !” we all whispered excitedly to each other. We were ecstatic. A bunch of exhausted students with wide smiles was Africa’s first impression of us. Behind them are: Ashley, David and I (Maddie). 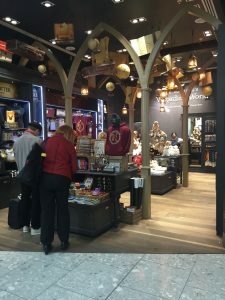 Harry Potter store in Heathrow. In the final stages of packing!!! Getting ready for our exciting trip to South Africa with the new crew…. watch for our first airport group photo! Sorry for the lack of pictures these past few days. The poor internet connection has made it very challenging to get photos uploaded to the blog. 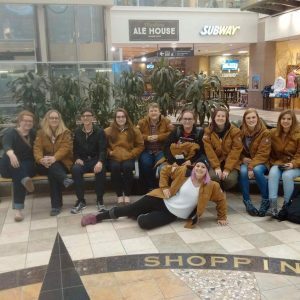 The last couple of days have been exhausting with 15 of us rushing through airports, picking up and dropping off baggage but the group has become proficient at clearing airport security. 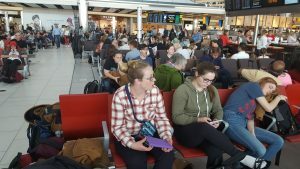 We are currently waiting at Heathrow International Airport to board our last flight that is slightly behind schedule (~30 minutes). We have had a great time in South Africa but we are also looking forward to getting home to our families and to be done these journals! We started the day off with a pleasant cottage breakfast with homemade hashbrown, traditional South African sausage, and toast (with the last of our peanut butter). After breakfast, we had an insightful lecture, by Dr. Maritjie Landman, on the practices of elephant management. We learned of both the positive and negative impact that elephants have on a thicket biome. Addo Elephant National Park currently has over 550 elephants that originated from a founder population of 11. Dr. Dan Parker showed us the bouma where five buffalo cows were held. Here at Addo, a lot of the animals are accustomed to noisy people and their cars. 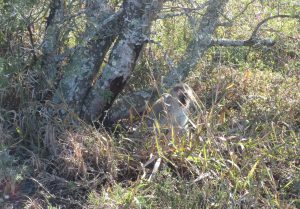 Today, a few of our fellow classmates had a close encounter with some vervet monkeys. It felt especially territorial towards Ashley Oates and Katie McQueen. As they walked to our meeting point, they saw a baby monkey sitting in the trees. As they stood to take pictures, the mother monkey appeared and chased them out of their vicinity. We then went on a leisurely morning game drive where we were lucky enough to see a dung beetle feasting on some feces. During the drive, we also saw some meerkats and a black-backed jackal. At the Domkrag watering hole, we saw a zeal of zebra drinking alongside warthogs and various duck species. Right before we filled our bellies with grilled cheese sandwhiches, potato salad and cookies. A herd of elephants ventured to the main camp watering hole. Half the group photographed them from an underground hide close to the main camp. We watched as large parade of elephants drank and bathed. We ended with a relaxing afternoon and our final dinner at the Cattle Baron. 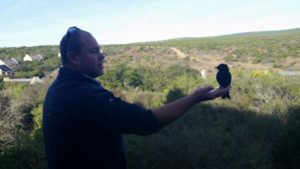 “A bird in the hand is worth two in the bush” – Dr. Dan Parker showing us how it is done! 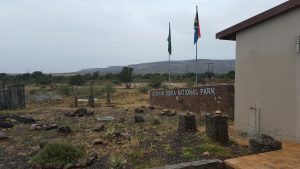 On our way to Mountain Zebra National Park…shopping?! It was a sad morning leaving Amakhala Game Reserve to head onto our next adventure. 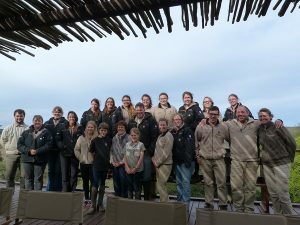 We had grown close with the staff at Amakhala and were really going to miss them, along with the two dogs and cat that we had become quite fond of at the camp. We had a delicious hot breakfast before getting on the road for our five-hour trip to Mountain Zebra National Park. The drive started out very noisy with lots of exciting chatter and singing, including multiple solos by Vered Krukovsky herself. It didn’t take long for it to quiet down as the students took full advantage of the drive to catch up on some much needed sleep. We took a break for lunch at a roadside food stop called Daggboer. There was also a small gift shop where many of us spent too much money African souvenirs and baked goods (seriously someone needs to take Janine’s wallet from her). 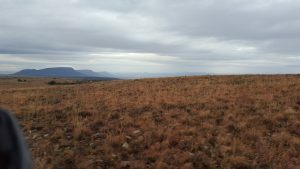 Once we got to Mountain Zebra, Dan took us on the scenic route into camp so that we could get a view of the beautiful mountainous landscapes in the park. Just a few of the species we saw included; red hartebeest, black wildebeest, mountain zebra, impala, blesbok and yellow billed duck. Our camp was located in the valley between mountains and each group of students retreated to their separate chalets until dinnertime. For supper, everyone gathered at Dan and Andrews’s chalet for a delicious meal of spaghetti, garlic bread and salad to end off a long day of travel. We started off the day with breakfast at Dan and Andrew’s chalet then headed out for a game drive at 9am. We saw numerous kudu, red hartebeest, and zebra as well as steenbok, eland and multiple bird species, all of which Janine insisted on stopping and taking pictures of. We arrived back at camp just in time for some lunch. The afternoon was spent hiking up a mountain trail to a beautiful view of the park. By the time we finished, most of us were hurting pretty bad and it appeared that the gourmet meals we had received at Amakhala were catching up with us. The group was split up for two evening game drives. Some of the nocturnal species we observed on our drive included the aardwolf, bat eared fox, black backed jackal, fiery necked night jar and spotted eagle owl. The night concluded with a superb dinner and dessert at the camp restaurant. If you ever find yourself at Mountain Zebra National Park, we recommend the lamb chops. Cheers to another great day in South Africa!Mountain Zebra. Our day started with a quick breakfast of cereal, toast and fruit before we headed out for a short game drive on our last morning at Mountain Zebra National Park. While out on our drive we saw many of the species we had viewed previously on other drives, but we had the opportunity to see Yellow Mongoose, Springbok very close to the bus, which made for some great photo opportunities. After returning to our cottages it was time to pack our bags to head out to Addo Elephant National Park. After a 4 hour drive plus a quick stop at Nanaga for lunch, we arrived at Addo. 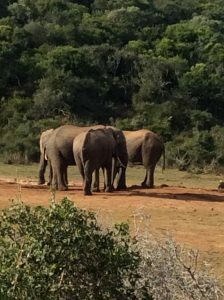 As we drove towards the main reception at Addo, Dr. Parker asked us to observe the difference in the vegetation in areas of the park where elephants had access to certain areas for only a short time versus areas where they had access for a longer period. There was a marked difference between the two areas, with regards to the height of the vegetation and the openness of the landscape. While driving in there were some chances to get some great photos of the elephants. After our drive into the park, we were checked in to our forest cabins and given a little while to relax before meeting for a braai (BBQ) at Dr. Parker’s chalet. On the menu was chicken and beef skewers, lamb chops, sausage and Kudu steak (for the adventurous type to try! ), potato salad, vegetables and roasted corn plus a dessert of milk tart or cheesecake. After cleaning up from our braai it was time to retire to our beds for the night. Another view on our drive through MZNP showing the Three Sisters. 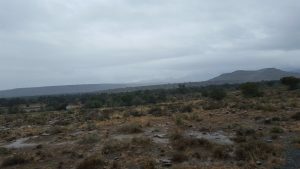 After we left Amakhala Game Reserve (I think everyone was a little sad to leave our South Africa home), we made the four hour drive to Mountain Zebra National Park for two nights and did not have wifi access….sorry for the lack of posts. Our final group picture with Jenn, Giles, James, and Emma Gush; Jason and Simone Smith; and Dan Parker – A wonderful place to have experienced with wonderful people! Today was our last full day staying an Amakhala and it was definitely a busy one. After breakfast this morning we drove to Grahamstown where we got to tour Rhodes University and see their brand new Zoology department. We got to go shopping at the local shops and got some awesome gifts for our families and friends back home. 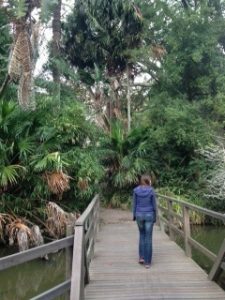 We relaxed in the middle of a busy day by taking a stroll through the botanical gardens. We ended our trip in town by visiting the Rhodes University store where we got some cool RU swag. Once we arrived at Amakhala we went straight to the classroom to attend a lecture by Dr. William Fowlds about veterinary diseases relevant to wildlife management on South Africa. This was a very interesting topic as we learned about the top four diseases that we are most concerned about, which are referred to as the big four. Following the lecture we had to sadly pack our bags as we will be leaving Amakhala tomorrow morning. The staff have been absolutely amazing and we could not thank them enough. Fortunately our adventure still continues as we will be making our way to Mountain Zebra National Park! At the Botanical Gardens in Grahamstown. 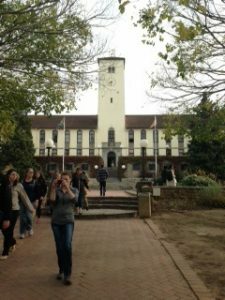 Our visit to Rhodes University to do some shopping. We woke up to a cool, yet sunny morning and watched the fog as it receded across the valley. We all met for breakfast at 7:30. After breakfast we all worked together to collect the camera traps that Vered used for her research projects and reassembled the small rodent traps that Eilish and Ashley had cleaned the day before. The rest of the morning was spent working on research projects and catching up on journals. A lunch of sandwiches and sausage rolls were served at 1:00. It was then that the Gush family stopped by so that the kids, Emma and James, could say their good-byes. 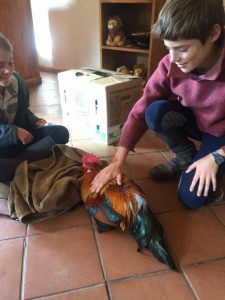 As a surprise for Andrew, James brought one of his roosters, Golden Boy, to say good-bye as well. A few of the students went to meet the beautiful bird. The remainder of the day we spent diligently analyzing data, preparing powerpoints, and perfecting oral presentations for our research projects. Time ticked away and before long the hour was upon us. We met in the lodge at 5:00 and the presentations began. About an hour later the presentations were done and we could all breathe a sigh of relief, as we were finally done. Supper was served shortly after, which was lasagna, quiche, squash, and salad. After completing our projects, everyone was exhausted, so we turned in for an early night.